Prime Minister Joseph Muscat has urged Opposition leader Adrian Delia to request a magisterial inquiry into money laundering allegations which he says have haunted the PN head for the past two years. Four months ago The Sunday Times of Malta reported how a London-based prostitution racket and the alleged involvement of Dr Delia were part of an ongoing money-laundering investigationby the police. Dr Delia had vehemently denied any wrongdoing. Addressing Labour Party supporters at Marsascala on Sunday morning, Dr Muscat said that while he would not get into the allegations that Dr Delia faced, insisting he would wait until investigations were concluded to comment, he urged the Opposition leader to go to a magistrate and request an investigation into the claims. “We are not like those who protested in the streets in an attempt to destabilise the country. We have always been consistent on this and so we will judge the Opposition leader when the investigations are concluded. But it would have been better had he asked for an investigation, just as I had done. 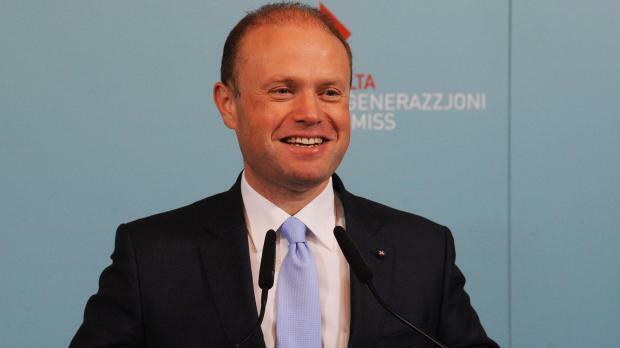 After two years of allegations, Dr Delia should go to the magistrate himself and ask for an investigation,” Dr Muscat insisted. The rule of law, he went on, was not something that one simply talked about but it is something that should be practiced and believed in. “I followed Adrian Delia’s press conference yesterday. He said that there were some journalists who asked him questions and he is saying that the documents were forged and that he has asked the police to investigate. I will not comment on this because I know what it feels like to have someone lie about you,” he noted. The Sunday Times of Malta has reported that a year after the FIAU flagged a “reasonable suspicion of money laundering” by the Opposition leader, the police investigation has hit a brick wall. The newspaper also said that a report by the anti-money laundering unit drafted in March 2018, concluded that sufficient information was available to conclude that Dr Delia and his bank account in Jersey “may have been used for money laundering”. Addressing a press conference on Saturday, Dr Delia announced he had asked the police to investigate documents that contained his signature and that he said were forged. While not describing the documents in further detail, Dr Delia said these had been brought to his attention around the same time he received questions from The Sunday Times of Malta. Moving on to major events that took place throughout the week, Dr Muscat referred to the government’s decision to make amendments to the Constitution in line with recommendations by the Venice Commission. “After the Commission handed us the list of the suggestions, we realised that these were items that were put to scrutiny when Malta was to join the EU but which were never, at least publicly, questioned. “Now, years later, we are in this situation but that’s no problem. In less than 100 days since the recommendations were made, with special thanks to Justice Minister Owen Bonnici who worked tirelessly on this, we will start implementing changes suggested,” Dr Muscat told his supporters. He argued that a number of the recommendations made by the Commission were already being put to practice even though they might not be written on paper. On the announcement made on Saturday that Air Malta had registered a slight profit, Dr Muscat said this was no easy feat and the airline’s success was thanks to its workers. He also commended the work of Tourism Minister Konrad Mizzi, his predecessor Edward Zammit Lewis as well as President Emeritus George Abela, who acted as the intermediary between the airline and workers’ unions. “Air Malta will become the airline of the Mediterranean. I am convinced that we will make it. But we’re not there yet. We still have a lot more to do,” Dr Muscat went on. On a government initiative urging pensioners to borrow money by putting up their property as a guarantee, the Prime Minister said that this was something that will further protect the elderly. Dismissing the Opposition’s criticism on the measure, Dr Muscat said that the scheme was already used by the private sector and that the government’s move would regulate the practice. He went on to add that in the coming days, the Labour Party would be unveiling a number of proposals to ensure that there would be more women politicians. He insisted, however, that these proposals were not about quotas but about ensuring equality. “As the saying goes, if not us then who? If not now, when?” Dr Muscat added as he concluded this week’s speech. Dr Muscat's speech was dismissed by the Nationalist Party, which in a statement said the Labour government had no long-term plan for the country and had "lost its social compass". Figures showed that wages were down and inflation was up, the PN said, and workers were ending up squeezed from either end.